The blessing of “Lehisatef Betzitzis” is recited over the wearing of the Tallis Gadol, upon wrapping it in a Yishmaeli wrap. How to wear the Tallis Gadol and how to perform Atifas Yishmaelim: See Chapter 1 Halacha 14B! The blessing of Lehisatef Betzitzis is recited upon wearing a Tallis Gadol. The order of the blessing is as follows: After checking the Tzitzis, the Tallis is unfolded and opened wide. One then kisses its upper edge, and swings it around from the position in which it was held in front of him, until it is hanging behind him. At this point, while the Tallis is behind him, the blessing of Lehisatef is begun. The blessing is recited slowly and is only concluded close to when one wraps the two right corners around the neck, over the shoulder of his left side. If one is not performing the Yishmaeli wrap with the Tallis Gadol, what blessing is he to recite? If one does not plan to perform the Yishmaeli wrap [such as due to lack of knowledge], and rather plans to simply wear the Tallis over his head and shoulders, he is nevertheless to recite the blessing of Lehisatef Betzitzis. If one accidently wore the Tallis Gadol without a blessing, may he still say the blessing of Lehisatef afterwards? Yes. He is to shake the fringes of the Tallis and then say the blessing of Lehisatef over it. If one said the blessing of Al Mitzvas Tzitzis on a Tallis Gadol is he Yotzei? Some Poskim rule one does not fulfill his obligation. Other Poskim rule one fulfills his obligation. Practically, the blessing is not to be repeated. 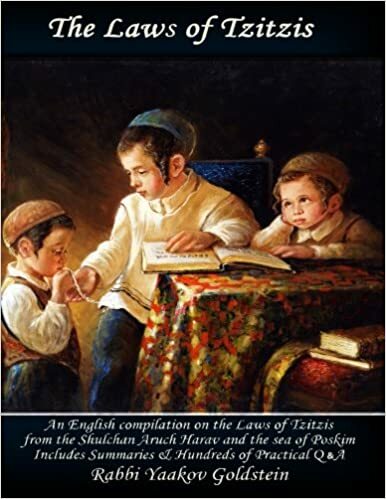 The word Tzitzis is mentioned and not Tallis, as the main Mitzvah is performed with the actual Tzitzis. 8/2; So also rules: Elya Raba 8/1; See also Levush 8/1; Taz 643/2; implication of Michaber 8/1; Poskim in Piskeiy Teshuvos 8 footnote 46 that one first at least begins the wrapping before the blessing. Ruling of Admur in Siddur-Before begin to wrap: In the Siddur Admur states “Prior to beginning to wrap one is to say the blessing”. Hence while in the Shulchan Aruch Admur rules to first begin the wrap before the blessing, in the Siddur he rules to do the entire blessing before even beginning the wrap, as rule the other Poskim listed below. Our custom in Sefer Haminhagim seemingly follows both opinions, as we begin the blessing before the wrap and continue it throughout the wrapping. When is the beginning of the wrap? See Sheiris Yehuda 1 and Piskeiy Teshuvos 8 footnote 43 for the meaning of this statement, and if it means to say the blessing while the Tallis is by one’s back, as is the Chabad custom to begin the blessing at that time, or if it means while it is already being wrapped, but just not like Atifa Yishmaeli with the Tzitzis thrown behind ones back, or prior to holding the Tzitzis in ones hands [as rules Taz ibid]. Previous Chabad tradition: In previous times, the Chabad custom was to place the Tallis over the head from in front recite and then recite the entire blessing, and only afterwards was the Atifa performed. [Siddur Admur; Divrei Nechemia 9; Custom of Rebbe Rashab as heard from Rav Eliyahu Landa, in name of the Ishkavta Derebbe]. See Admur 8/29 [regarding if Tallis Gadol was replaced during Shemoneh Esrei]; M”A 8/12; P”M 8 A”A 12; Piskeiy Teshuvos 8/5 and 21; See Chayeh Adam 12/4 that one may even initially say this blessing on a Tallis Katan! The reason: As Admur 8/5-6 explains that the main ruling follows the opinion that states one is not required to do Ituf, and the wording of Lehisatef is going on the covering of the head. Vetzaruch Iyun why Rama/Admur rules to recite Al Mitzvas Tzitzis by a Tallis Katan even if it is large enough to perform the Atifa and he simply chooses not to do so, if we rule like the opinion that holds one is not required to do Atifa, as explained above! [See Chayeh Adam ibid that for this reason rules one may recite Lihisatef oin a Tallis Katan even initially!] Perhaps the explanation is that even according to the lenient opinion in order to say the blessing of Lehisatef it must at the very least be a type of Tallis that is at times worn over the head, however a Tallis Katan that is never worn over the head is not valid to recite Lehisatef. The reason: As Admur 8/5-6 explains that the main ruling follows the opinion that states one is not required to do Ituf, and the wording of Lehisatef is going on the covering of the head.